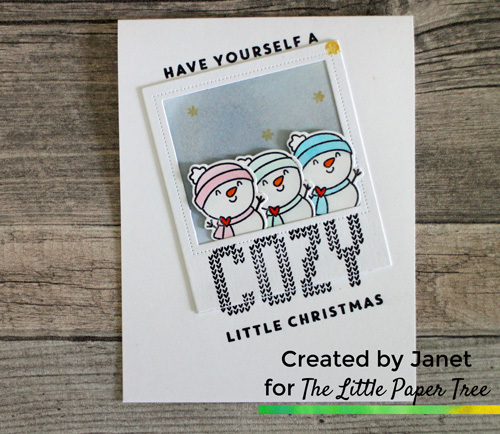 Hello, Janet here with a cute critter Christmas card. I don’t play with critters very often but I enjoy finding new scenes and ways to use them. How are you getting on with your Christmas Card making? I know it is still October and Halloween hasn’t even happened yet, but it can be good to get cards made for the most important people before the busy ‘silly season’. I thought I would make a card with the snowmen taking a selfie with an old school polaroid. All the products I used are currently in stock and available from the online shop. I have listed and linked all the products at the bottom of this post. I used Avery Elle and Concord and 9th products. Now onto my cute card featuring snowmen. I diecut the Photo Mat frame twice from some bright white Neenah card and ink blended on the one of the inside squares with Stormy Sky Distress Oxide ink, and a little Black Soot Distress Oxide to make it darker. I stamped some stars from the Avery Elle stamp set with Tiara ink to add some interest. I stamped the cute snowman from the Christmas Magic (I always want to call it Magical Christmas) stamp set three times with an archival ink and coloured the scarves, hats and carrot noses with my Zig markers. The colours I used will be listed below. I die cut them with the coordinating dies and started putting my card together. I cut and scored a sheet of Classic Crest Neenah card to make a card base to make a top folding card. I placed my Photo Mat frame onto the card to figure out the placement. I knew the Cozy stamp would be too big to fit on the polaroid style frame, so I stamped the Cozy directly onto the card base, and again on one of the frame dies. Then I adhered both frames together with thin Scor Tape. I placed the frame onto the card base and adhered my sky into the gap. I adhered the layered frame to the card base and used foam tape to pop up my snowmen. I tucked the bottom edge of them under the frame. I finished by stamping the rest of my sentiment above and below the polaroid frame. I hope you have enjoyed this card tutorial. Feel free to share your cards with us over at the Facebook group. Here is the supply list to make this card.